Status: Common regular resident west, fairly common central and east. Rare regular winter visitor west. Documentation: Specimen: UNSM ZM6321, 12 Dec 1895 Fort Robinson, Sioux Co.
Taxonomy: There have been several recent changes in assignment of woodpeckers to genera. Leuconotopicus includes species previously assigned to Picoides (Fuchs et al 2015, Gill and Donsker 2017, Chesser et al 2018): Red-cockaded, Smoky-brown (of Mexico and South America), Arizona, Strickland’s (of central Mexico), Hairy, and White-headed. Ten subspecies are recognized, separated into four groups by Pyle (1997); the Interior Western Group contained subspecies septentrionalus which included monticola, but Jackson et al (2002) retained monticola separate from septentrionalus, which we follow for reasons of simplicity in understanding ranges. Subspecies monticola winters south to Nebraska. Pyle’s (1997) Eastern Group consisted of terranovae of Newfoundland, villosus, breeding west to Central North Dakota and northern Texas, and audubonii, breeding east of villosus, from southern Illinois to eastern Texas. Nebraska breeding birds are presumed villosus; earlier authors suggested that monticola may be resident in northwest Nebraska as it is in the Black Hills of South Dakota (Bruner et al 1904, AOU 1957), but it is more likely that it occurs only as a winter visitor; it occurs at Barr Lake, Colorado, late Aug-early May, where local breeding birds are villosus (Andrews et al 2002). The only documented records of monticola in Nebraska are of a female in a Scotts Bluff Co yard 3 Feb 2013-17 May 2014 and again 1 Jan and 7 Feb 2015 (Kathy DeLara, personal communication; photo), and one at Box Butte Reservoir, Dawes Co 24 May 2016. These birds had no white markings on the greater coverts (“shoulders”). Possible occurrence of septentrionalis in winter in Nebraska is discussed under Winter. Resident: The preferred habitat for this species is mature forest, and so in summer it is most numerous in the east but is distributed evenly over the rest of the state in lesser numbers. BBS data (1967-77) indicate that this species is far more common in the east than elsewhere. In winter and during migration periods it occurs statewide in virtually all arboreal habitats; at this season it is often found in cities and towns. High counts: 12 at Fontenelle Forest, Sarpy Co 1 Apr 2017, 11 at Harlan Co Reservoir, Harlan Co 19 Mar 2010, and 11 at Fontenelle Forest 3 Apr 2010. Winter: Although this species is usually considered to be resident, there is “evidence to indicate a general southward movement in fall; the individuals seen in winter are probably not the same as those seen in summer” (Bent 1939). Jackson et al (2002) state that there is no evidence that true migration occurs but cite several examples of influxes of northern subspecies including septentrionalus. Altitudinal movement of the Rocky Mountain (and Black Hills) birds, monticola, occurs in fall and spring, with these birds appearing on the Colorado plains in winter (Andrews and Righter 1992, Andrews et al 2002) and presumably also in western Nebraska. Interestingly, CBC data indicate even distribution across the state, in contrast to the summer concentration in the east indicated by BBS data, suggesting an influx into western Nebraska in at least early winter. 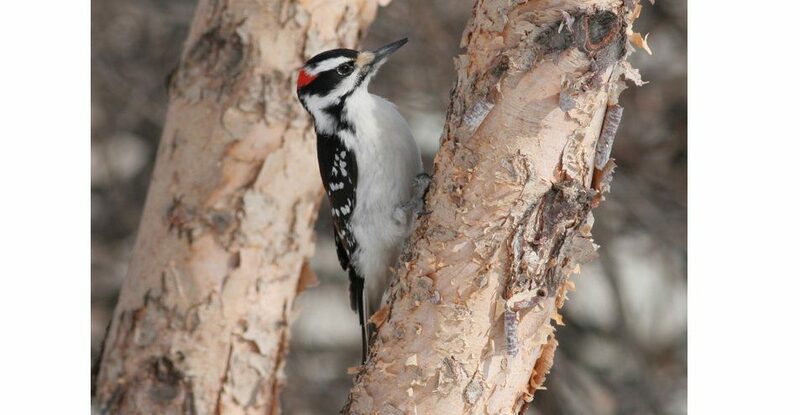 Rosche (1982) stated that Hairy Woodpecker is more numerous in winter in the northwest, but that no winter influx was noted further east in the Keith Co area (Rosche 1994). Photograph (top) of a Hairy Woodpecker at Papillion, Sarpy Co 18 Feb 2008 by Phil Swanson. Jackson, J.A., H.R. Ouellet, and B.J. Jackson. 2002. Hairy Woodpecker (Picoides villosus), version 2.0. In The Birds of North America (A. F. Poole and F. B. Gill, Editors). Cornell Lab of Ornithology, Ithaca, New York, USA. https://doi.org/10.2173/bna.702.